The Berkey fluoride water filter uses a time tested method that was developed to reduce fluoride in your drinking water. Berkey developed this filter to address the concerns of the many who find the practice of adding fluoride to drinking water questionable or unacceptable. Fluoride has been deliberately added to many municipal water supplies since the 1950's. This common practice is now becoming more controversial to say the least. New reports and studies about the harmful effects of adding fluoride to drinking water are emerging. The health and hygiene benefits of applying fluoride directly to the surface of teeth are a well known and seldom disputed. The dispute begins with fluoride that has been added to drinking water only comes in contact with the teeth for a very short amount of time and in a very diluted form. After this contact the fluoride is than swallowed and the human body is subject to the well known ill effects of the fluoride compound for hours after ingestion. Critics claim that in this age of high fluoride tooth pastes that are correctly applied directly to the surface of the tooth, the benefits of fluoride in the water supply are negligible and quite possibly unnecessary. Berkey fluoride water filter allows you to make this decision about your health for yourself by reducing the amount of fluoride in your water by >95%. It is recommended that each set of two Berkey PF-2™ fluoride water filters should be replaced after 1,000 gallons (3,785 liters). Example: If you had a Big Berkey system (2 gallon capacity) and you refilled the system 2 times per day, you would be using 4 gallons of water per day. Under these conditions the PF-2 fluoride water filter elements would last 250 days (1000 gal. divided by 4 = 250) or a little over 8 months. Actual replacement period for the PF-2 fluoride filter is dependent on how much water you would use and the presence of other competing contaminants in the source water. High levels of arsenic, fluoride and certain heavy metals may negatively affect the efficiency and capacity of the PF-2 elements. Testing was performed with a flow rate of less than 11 liters per minute per cu.ft. of the Berkey filtering medium at 20 - 30 parts per million (ppm) of the ion in the solution liquid. Results of < 1ppm of the fluoride ion in the effluent were typical for the filter media (>95% reduction). Under optimum laboratory conditions, effluent concentrations of less than 50 part per billion (ppb) were readily achieved which equates to a >99.75% reduction. ARSENIC: Arsenic cations and arsenic oxide anions have unique properties that this Berkey filter product effectively targets. arsenic, fluoride and other competing heavy metal ions. Unusually high levels of these contaminants may reduce the capacity and efficiency of the elements. 1) Do not subject to freezing temperatures, high heat or boil the fluoride water filter elements. 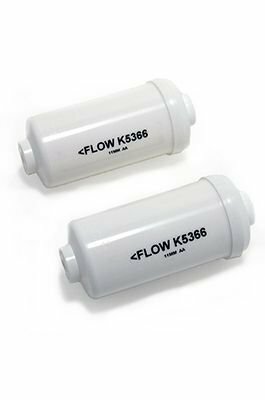 2) Under normal circumstances the PF-2™ canisters reduce water filtering flow rate of most Berkey filtering systems by 15-20%.